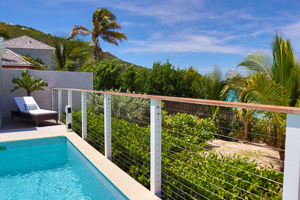 Villa UJV 392, also known as Celina, is a charming 2 bedroom beachfront villa located in the heart of Flamands Beach. A short stroll along the beach takes you to the restaurants at the Isle de France and Taiwana hotels. The beach is accessed via a sand path which immediately immerses you in the oceanfront lifestyle. The two bedrooms share a bathroom, and are furnished with king sized beds. The L-shaped living room has an inviting sectional sofa and is open to the well-equipped kitchen which has a large breakfast bar. The dining area has the option to be completely open to the outside, or closed-in when needed. Guests enjoy the sweet sound of rolling waves from the villa. Outside is a small pool that looks directly over Flamands beach and the ocean. There is a private seating area in the sand just above the public beach for lounging. Because of the direct beach and ocean access, children under 10 years old are not allowed. Maid service @ 9am daily, except Sundays and French holidays. 2014 French Holidays: 01/01, 04/21, 05/01, 05/08, 05/29, 06/09, 07/14, 08/15, 11/01, 11/11 & 12/25. Villa UJV 392 is ideal for a couple, or a family with older children..